Advertise at trade shows, meetings, school functions, and hospitality events while dressing up your banquet tables. 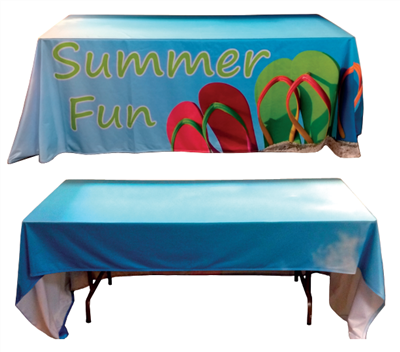 Our unique Table Covers offer a great way to display brands, logos, and messages at conventions, meetings, job fairs, and expositions. Printed in full color on 9 oz premium polyester fabric (Premium Matte or Satin) using dye sublimation - your image will extend from edge to edge of the material. Covers 3 Full Sides of your table with a 10" overhang on the backside. Available for 6' and 8' wide folding tables. Product does not ship same day. Most orders ship 5-7 business days after proof approval. Call for more information on RUSH & International Options @ 317-292-7542.